This definitely isn’t a paleo recipe… especially since it’s main ingredients are potatoes and lots of cheese! 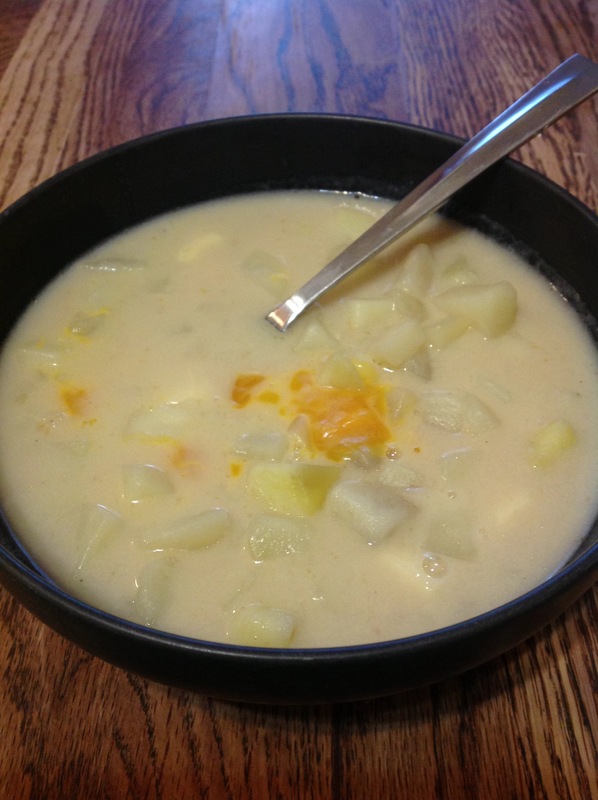 However, I grew up with this and it’s one of my favorite soups! The kids love it too! It isn’t hard to make and can be prepped easily in 1 hour although it may take a little longer to cook, just to get the potatoes to the correct tenderness. Also, since I’ve been prego I’ve been craving comfort foods, foods I’ve grown up with and fast food. I usually don’t ever crave fast food, but now I salivate upon passing taco bell, burger king or the like… it’s crazy! In my past three pregnancies food just never tasted like what I envisioned or craved and it’s like that again this time. I may crave a burger and we have them for dinner and it just doesn’t hit the spot like I had hoped! But this soup… it worked wonders! I think I finished ALL the leftovers myself! This used to be a milk based soup, but I’ve changed it a bit and added the coconut milk instead of the milk. Most of the family does consume dairy, but Brian really shouldn’t have too much and Aisling still can’t have any at all. I decided to change the soup base so that we all could have it and I didn’t have to make two different versions. Before serving the soup, I cube some cheddar and pepper jack cheese and place it in the empty bowl and pour the soup over top. By the time we’ve all gotten up to the table and the blessing has been said the cheese is soft and melty and delicious! I do splurge every now and then and get a special cheese for Aisling. She is now old enough that she is wanting exactly what everyone else is having! I’m so thankful it took her 2 years to figure it out! 😉 We had a good run of it! A friend of mine told me about [amazon_link id=”B00475XUBA” target=”_blank” container=”” container_class=”” ]Daiya[/amazon_link], a cheese substitute and it’s amazing! They sell it in slices, wedges or shredded. It even melts! It was very hard to find something that was soy free and dairy free, but this is it and she really likes it! It doesn’t taste exactly like cheese and I would definitely rather have the real thing, but it certainly doesn’t taste BAD like some of the others we’ve tried! So Aisling got some of the [amazon_link id=”B00475XUBA” target=”_blank” container=”” container_class=”” ]Daiya cheese [/amazon_link]in her bowl and was completely satisfied! Melt the coconut oil or bacon grease in the bottom of the soup pot. Saute the onions, until they are soft and translucent add the rest of the ingredients and bring to a boil. Then turn down to simmer until the potatoes are soft and tender. Usually takes about 20 minutes depending on how large the potatoes are.